This extraordinary painting by Zurbarán, the only signed and dated still life by this great master of the school of Seville, has been widely admired as a masterpiece of the genre. To devout Spanish Catholics in the 17th century, the apparently humble objects portrayed here contained significant religious meaning. The measured placement of the three motifs, for example, would have been instantly understood as an allusion to the Holy Trinity. The painting has also been interpreted as an homage to the Virgin, with the oranges, their blossoms, and the cup of water symbolizing her purity, and the thornless rose referring to her Immaculate Conception. 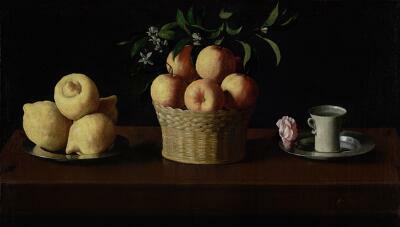 Zurbarán depicted the physical character of the objects, and the space they inhabit, with unparalleled focus and skill. By modeling the rough-skinned yellow citrons with hints of green and russet, he suggests the fruit’s protuberance and weight. The arrangement of the orange leaves creates a rhythm of light and shadow, echoed again in the reflective surfaces of the pewter plates. Presented as a quiet, meditative piece within a shallow, minimally described space, this still life evokes a mystical intensity that transcends time in its appeal. A recent cleaning has removed opaque layers of varnish and discolored retouches, revealing once again the clearly defined edges of the table, the four decorative inlays at each corner, and Zurbarán’s characteristic skill in describing the rough, textural skin of the citrus fruit. The welcome balance between the dark, atmospheric background, the warm tones of the fruit and basket, and the cooler tones of the silver plate and ceramic cup have been restored. Click here to watch a video about the 2008 restoration of this painting. Although painted with meticulous naturalism, there is something unique and mysterious about this group of commonplace objects. Silhouetted against the darkness by a brilliant, almost unearthly light, the motifs seem suspended before us like objects of meditation. Placed with infinite care, they lead our eyes rhythmically from left to right: the tip of one lemon points up to the flowering sprig that crowns the beautifully delineated basket of oranges. Blossoms and leaves guide us across to the pewter plate with its white cup and single rose. This remarkable painting by the 17th-century Spanish artist Francisco de Zurburán is his only signed and dated still life. It may actually be intended as a mystical evocation of the Virgin Mary. Oranges and orange blossoms symbolize her purity and chastity. The cup of water and smooth-stemmed rose also allude to her purity and love. The Virgin was often referred to as a “rose without thorns.” The cup, filled with water, symbolizes her role as the pure and sinless vessel worthy to bear the son of God. This symbolism would have been understood instantly in the monastic communities that usually commissioned Zurburán’s works. The painting’s greatness lies, however, in the artist’s ability to endow these humble objects with an aura of profound spirituality. And now it’s time for the adventures of…Sam Spectacle, Art Detective! You mean one o’ them fruit and flower pictures? Exactly. But Zurbarán usually painted religious subjects, like saints and the birth of the Virgin Mary. Why would he do a simple still life of lemons, oranges, and a rose?! Hmm…lemons, oranges and a rose. Three things. Kinda like the holy trinity…. You mean The Father, The Son and The Holy Spirit? Bingo, baby! And look! Just as I suspected, the rose has no thorns, the lemons are ‘citrons’ which are associated with the celebration of Easter, and…there’s a cup of pure water next to the rose. So—these objects are Christian symbols! The oranges, the rose and the water all stand for the Virgin Mary.